The use of LED bulbs has effectively reduced power required whilst also increasing illumination levels. Direct sunlight used to be essential for solar light to work efficiently. Recent solar technology harvest energy much more efficiently. The speed of technology development is expected to continue to accelerate in the years to come. 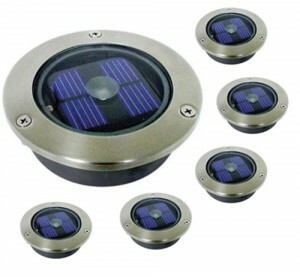 Several different types of solar lighting are available. Wall mounted lantern style lighting. Lanterns for post or hanging mounts. Fairy lights in many different designs and colours. Deck lighting which is mounted flush with the timber surface. Solar powered lighting with security motion sensors. Solar panels for lights are either built into the light unit itself, or housed in a wired, remote panel. Different applications will suit the two different designs as each has its own pros and cons. Integrated panels are often smaller in order to fit within the unit, which can sometimes limit the operational performance of the unit. With external panels, you can position them for maximum sunlight. Being larger, they also harvest more light faster. High quality replacement rechargeable batteries will improve the performance of your solar lights. Most factories fit low cost batteries rather than high performance ones, so it is a good idea to up spec them if you can. Solar lights are hugely affected by their location. Your solar lights sensors should ideally be positioned so that they can receive direct sunlight during daylight hours. Solar lights charge much slower in the shade, so position your lights in bright areas for best results. Even though solar lights are designed to work in normal UK weather, things such as the shade of a tree will reduce performance. Battery and solar panel technologies are the two areas that will further improve solar lighting performance. Sales of solar lighting devices are growing every year and there is little sign of this trend reversing.